All this time you thought awards season was about the recognition for good work and the little statues they give you. P’shaw…it’s all about the swag baby. In the days leading up to awards shows, the stars are invited to gift and luxury suites and are pampered with luxuries us average blokes could only imagine. From manis and pedis, to spa days, to so many free clothes and products one might think these people didn’t have enough money to pay for it all in the first place. Ah, to be a celeb. What it comes down to is publicity. The companies behind the swag give away the goods in hopes that the star will be seen with them or talk about them and help sell the product for them. Sounds like a pretty frakkin’ good trade off to me. Anyway, our friends over at The Office are now in the big time, and they get invited to all these fun events. 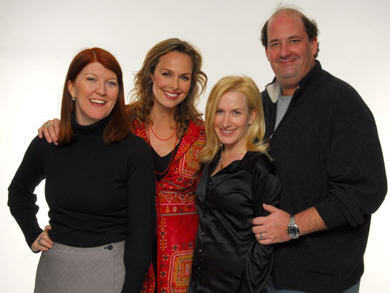 I couldn’t help but share some of the great pics of the cast of “The Office” and their swag. Best of luck to The Office…here’s to hoping you take home Best Comedy!! Love the one of Angela and Brian! What fantastic pictures! The one of Angela and Brian is hilarious. And I had no idea that Melora had a daughter! That is one heck of a cute little girl. I almost fell off my chair laughing at that picture of Phyllis holding up the red bra. Brian with the Zebra purse was hysterical too. The office cast looks like they know how to have fun where ever they go. where are these from? are there others? i found some more on wireimage. do u have an account there?